What Vintage Star Wars Ships and Vehicles Were Produced? As well as the Star Wars figures there were also a multitude of classic and beloved Star Wars ships and Vehicles.Many of them even more iconic than the characters in the movies, such as; Luke Skywalker’s Landspeeder the Millennium Falcon, the TIE Fighter, the X-Wing fighter, the All Terrain Armoured Transport or AT-AT, the rebel Snowspeeder and the AT-ST Scout Walker. Finding these Star Wars ships and vehicles with complete, undamaged packaging is extremely rare and the last few examples like the Imperial Shuttle, the A-Wing and B-Wing are some of the hardest to find and command very high prices for mint condition. 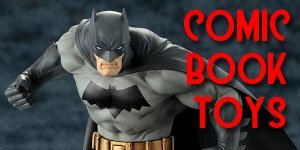 These also made excellent diorama displays to make your carded and loose figures feel very much surrounded by a window of their time. 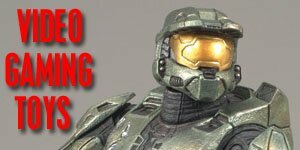 There were also twelve inch figures, roleplaying toys, miniature playsets and too many other merchandising examples here and that was before the second explosion in popularity that began again with Hasbro in the late 90s and has not stopped. 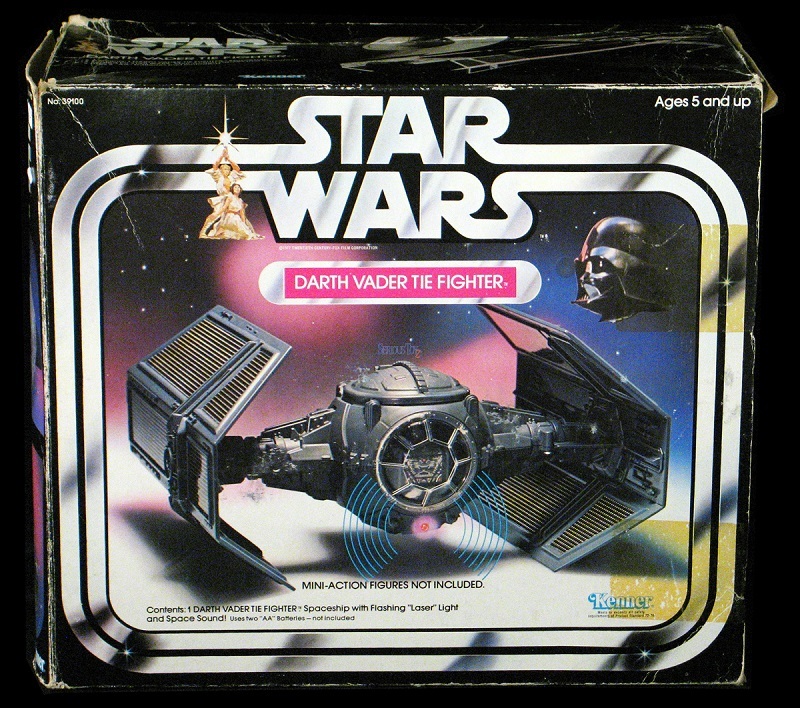 First released in 1979 the Darth Vader TIE Fighter only ever featured the Star Wars logo although there were three variations of the packaging. 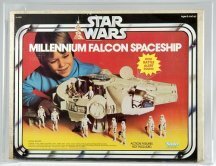 The version released in 1980 was identical to the first except for the addition of a cardboard diorama and a "Special Offer" sticker. The third variation, released in 1984 as part of the "Collectors Series", added the word "Vehicle" to the title and a "Collectors Series" starburst printed in the top right-hand corner. (2) Wing extensions that attach wings to body of TIE Fighter. 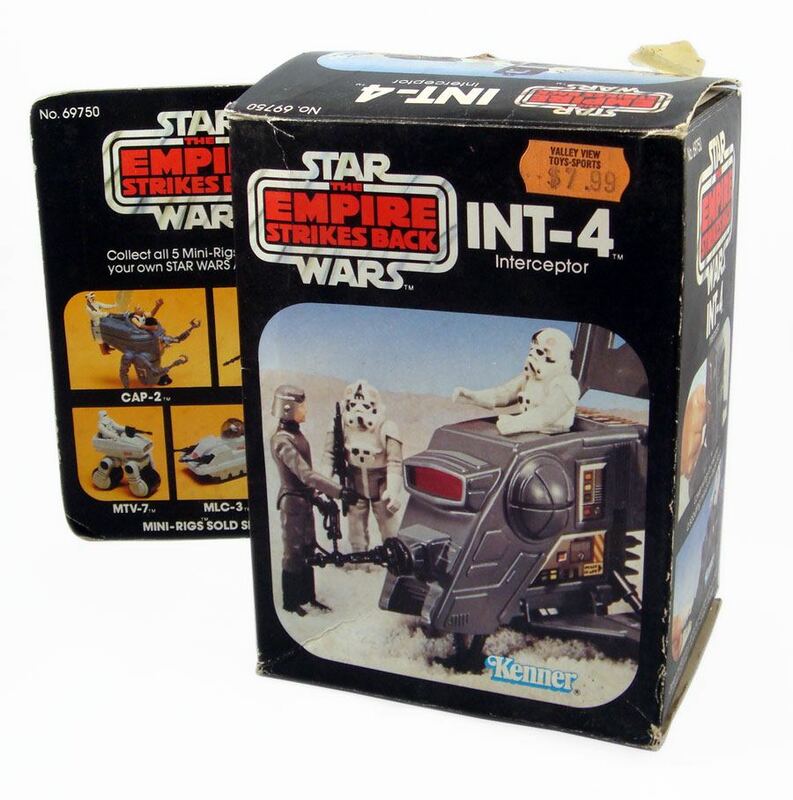 The Imperial TIE Fighter was one of the original vehicles released in 1978, the earlier vehicles didn't feature the Special Offer sticker advertising the inclusion of two figures: a Stormtrooper and Darth Vader, that later packaging did. 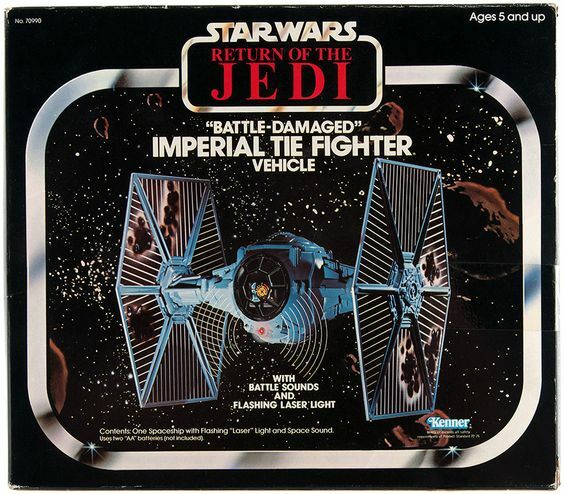 There were also two other changes to the packaging at later dates, the first in 1979 when it was renemed 'Imperial TIE Fighter' and the blue LP logo was removed. Then in 1980 the "Star Wars" logo was replaced by "The Empire Strikes Back" logo. The Imperial Troop Transporter was released in 1979 but did you know that this vehicle never actual appeared in the movie? 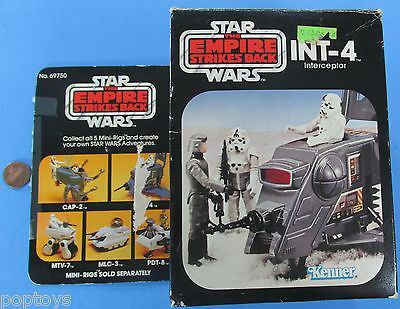 In fact, in the instructions booklet Kenner created the myth/story that it was this vehicle that was used to destroy the Jawa's Sandcrawler in an off-screen moment. The vehicle had two prisoner immobilization hoods and featured six authentic sounds from the movie and could hold up to EIGHT Star Wars figures. 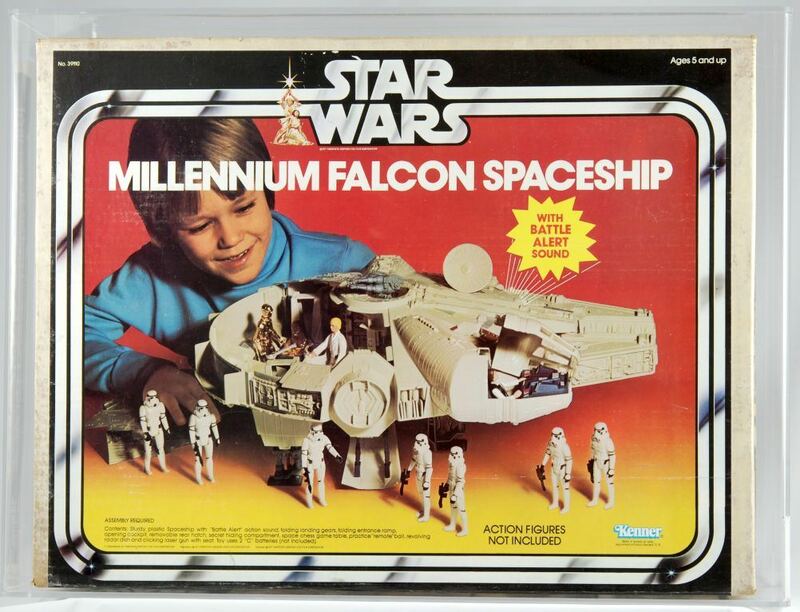 A Sears exclusive was released in 1982 without the electronics, thereby creating a large cargo hold, renaming it an Imperial Cruiser and changing some of the paintwork etc. The Lanspeeder was probably one of the most iconic vehicles from the Star Wars movie and was released in 1978 along with the original figures and playsets. 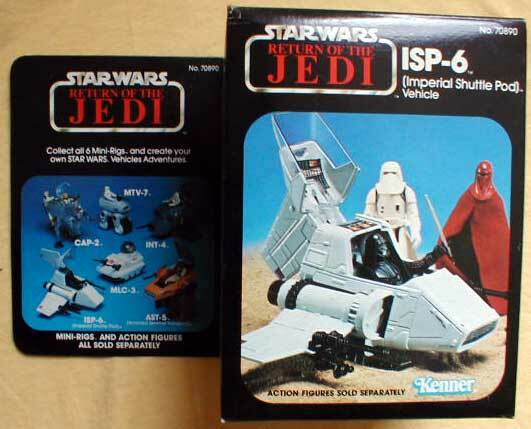 There was also a JC Penney exclusive Radio Controlled Land Speeder released. Earlier Lanspeeders came without any figures but later releases included a Luke Skywalker and See-Threepio (C-3PO) figure. There were two international variants of this vehicle released. The Palitoy version in the UK which didn't have an opening hood ( or bonnet for our American cousins). 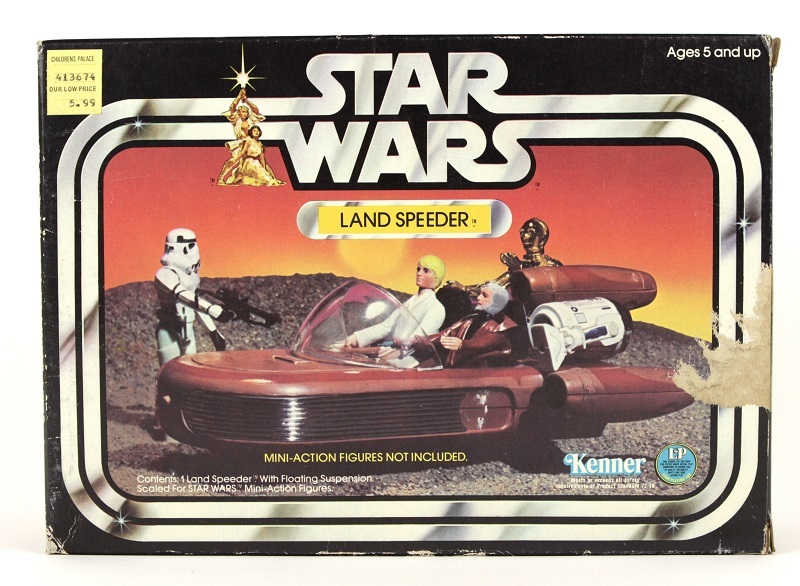 The second was an Australian version, which was also released in Canada by Kenner Canada, produced by TolToys that featured stickers, or decals, rather than painted details of the Kenner Landspeeder. This was also later released in 1984 as part of the "Collectors Series" alongside the Darth Vader TIE Fighter and Patrol Dewback. What can I say? It's THE Millennium Falcon and what boy DIDN'T want one of these? This is probably on of the most iconic movie spaceships ever, ranking up there with the USS Enterprise! Due to its size and the detail required this vehicle took Kenner a while to design and configure, so wasn't released with the original batch in 1978 but a year later in 1979, but it was more than worth the wait! It was repackaged a year later, in 1980, when the blue LP logo was switched out for "The Empire Strikes Back" logo. 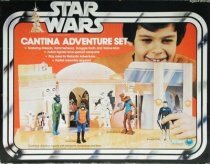 In 1981 it was repackaged again with Bespin Cloud City artwork and then again in 1983 with Tatooine images and a "Return of the Jedi" logo. 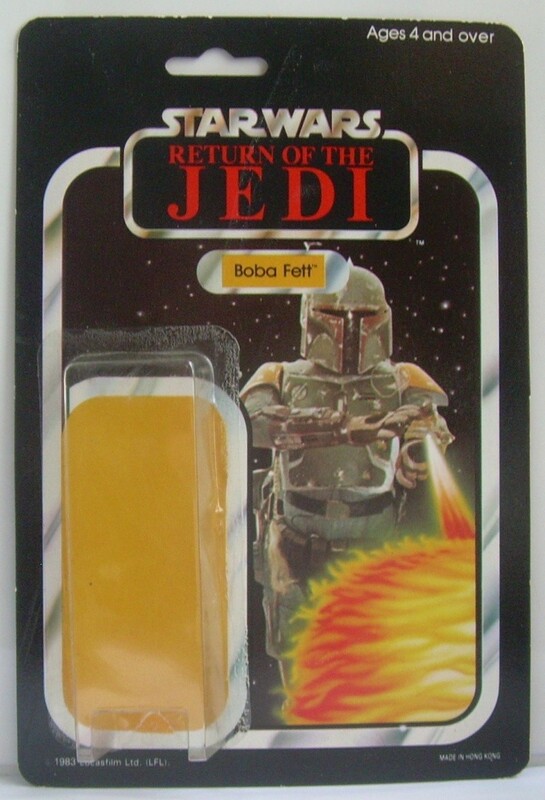 This is one of the Holy Grails of the Vintage Star Wars figures and is one of the most sought after by collectors. The U.S. release on featured packaging with the Star Wars log and a "Special Offer". 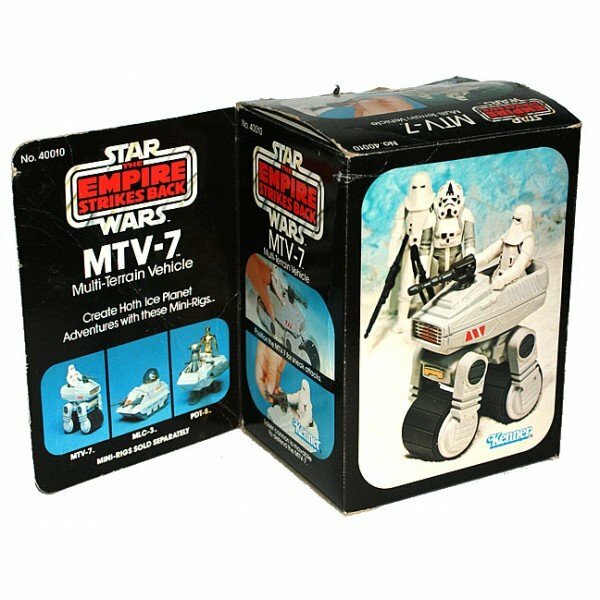 There was also a Kenner Canada version with a "The Empire Strikes Back" logo on the packaging as well as TESB logo stickers covering the original Star Wars stickers on the remote control. 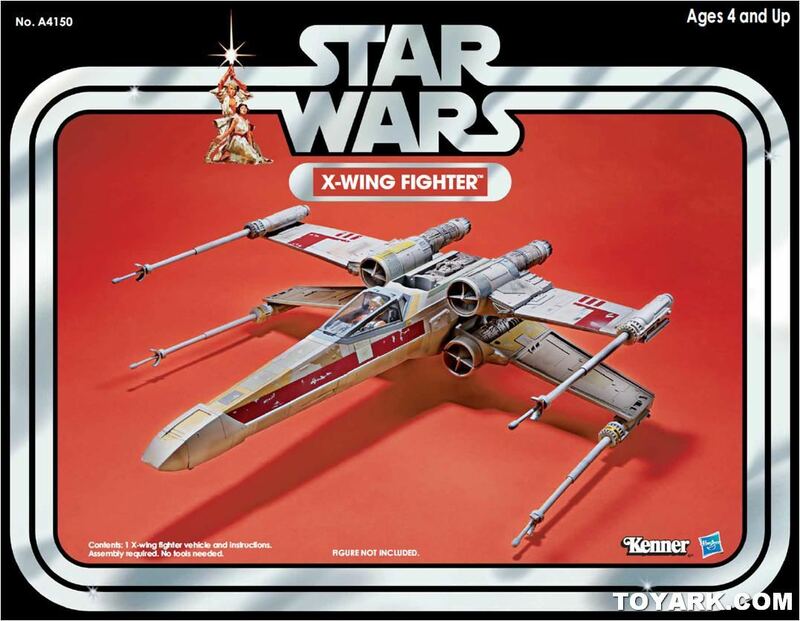 The notorious X-Wing fighter was one of the original released vehicles in 1978. The packaging was altered slightly in 1979 to include an image of Luke Skywalker and dropped the blue LP logo from the original release and later, in 190, it featured TESB logo. 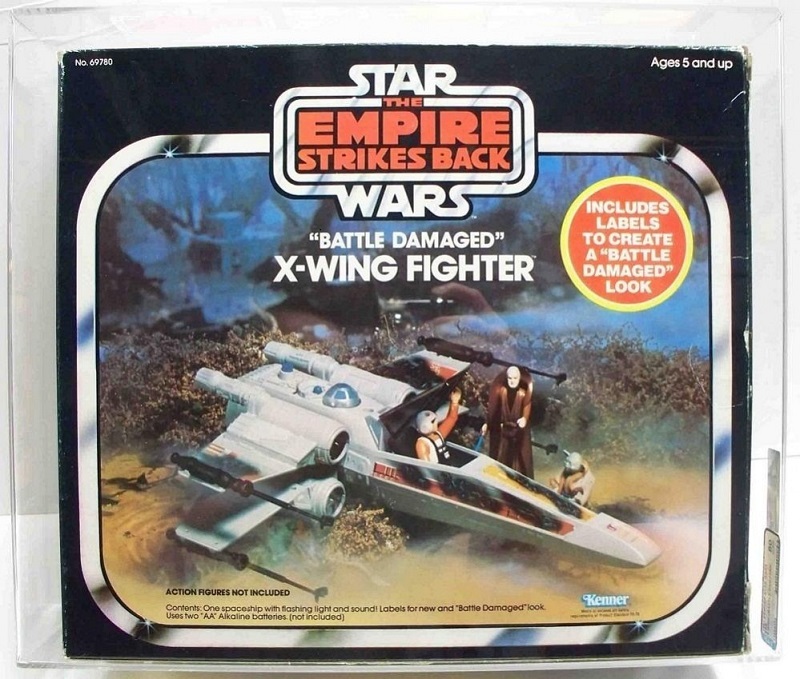 The X-Wing released by Palitoy in the UK however didn't have the electronic light and sound. It also had a different nose a vac-metal R2 head, alternate sculpting behind R2, and and a black and white sticker instead of the sculpted portion found on the standard version. OK, technically this isn't a vehicle, but then it isn't a ship or playset either, so this seems to be the best place for it. The Patrol Dewback was a large lizard tye creature ridden by the Imperial Stormtroopers searching for R2-D2 and C-3PO. Originally this figure was only released in the U.S. and wasn't officially released in Europe until 1997 as part of the Special Edition series. 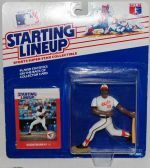 There were three versions of the Keener Deback, with the original being released in 1979 and the a "Collectors Series" version in 1984 with the starburst in the right-hand corner. 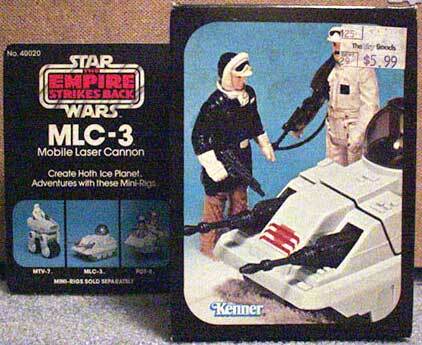 The third version was a Kenner Canada version that available in an Empire Stikes Back box. 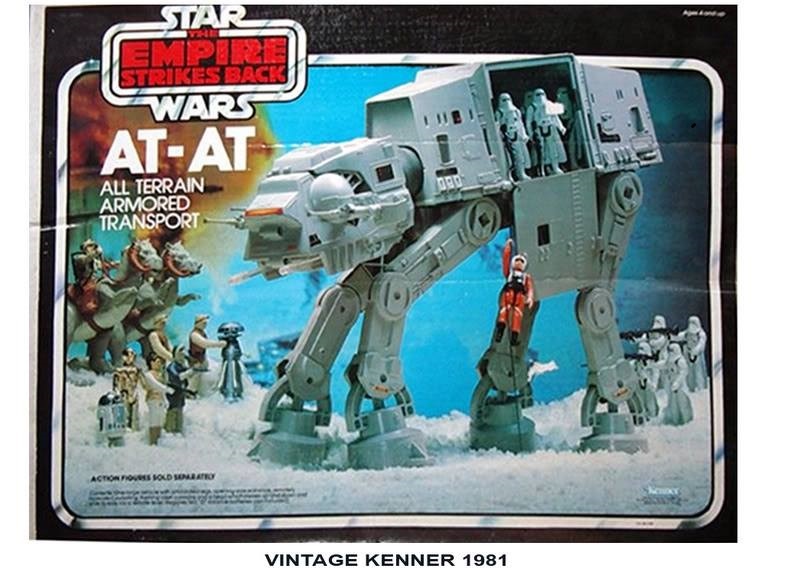 One of the best vehicles that Kenner released in the Vintage Star Wars line was the All Terrain Armored Vehicle, or AT-AT as it was commonly known. However it was also THE most expensive vehicle, ratailing at $47.99 compared to $32.99 for the Falcon and $14.99 for a Snowspeeder. The AT-AT was packed with features including lighting-up and pulsating Chin guns, side lasers that turned, and removable side panels that gave access to the interior and an opening canopy with room for 2 figures. The hull was molded in gray while the original is white. The canopy was molded in tinted plastic instead of clear. The Engine inlets (shield generators) were black instead of white. Stickers included so that "damage" could be applied to ship's hull. Wings open when R2's head is pressed down. The wings shut when the blue button forward of R2 is pressed to the rear. Laser sound is generated and LED in nose lights up when fire button is pressed. Front landing skid is manually retractable. 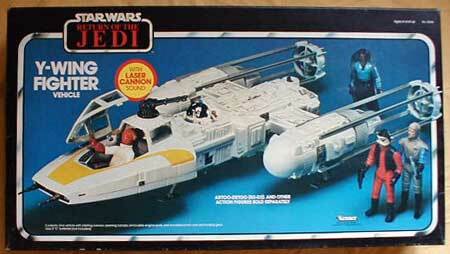 It also came with 4 laser cannons and a canopy. 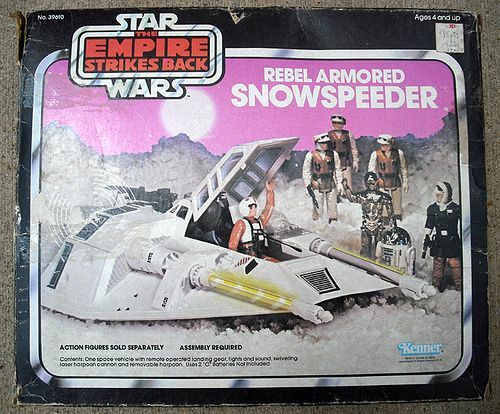 The Rebel Snowspeeder had a detachable harpoon with two feet of string that was connected to a plastic anchor that fitted into the back of the vehicle. This is the part that is generally missing. The Snowspeeder was also one of the first vehicles to incorporate LED lighting as well as the standard "laser" sound. At the front there was spring loaded loaded landing gear that when retracted was held in place by a sliding retainer and when the retainer was pulled the skid popped out. There was also a sliding canopy that revealed a cockpit with seating for two figures. 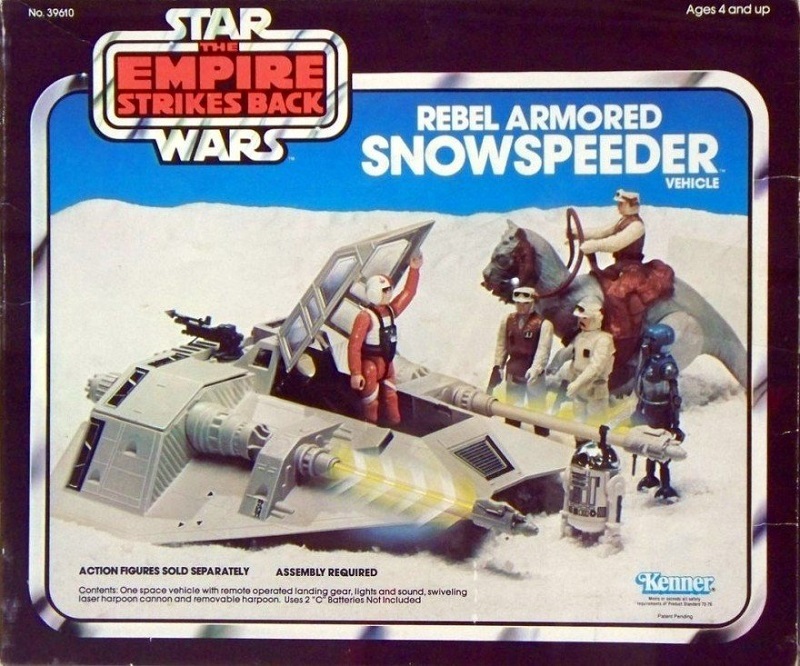 This vehicles was released in 1980 and was only available on a TESB card. Harpoon assembly: harpoon, string, anchor. The Rebel Transport interior was accessible by turning the handle at the top 90 degrees, thereby unlocking the two halves. 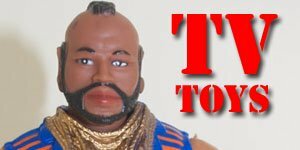 With the top removed in this way the "Crew Chamber" could be used as a figure storage area. 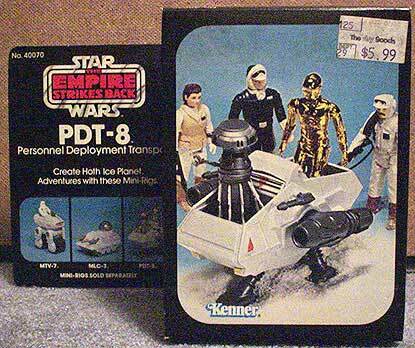 The Rebel Transport also came with the same backpacks and gas masks available in the Action Figure Survival Kit mailaway. The ship also featured rotating and elevating canons, an escape hatch at the bottom of the ship and a secret storage compartment. 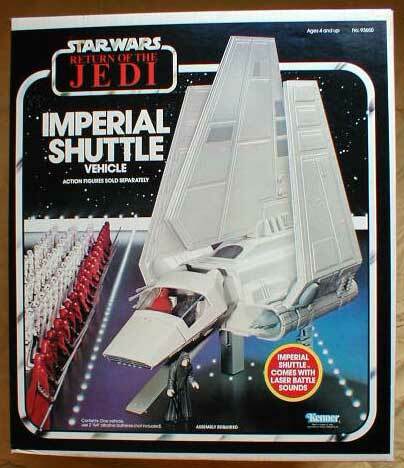 The Rebel Transport was released in 1982 on a TESB card only. 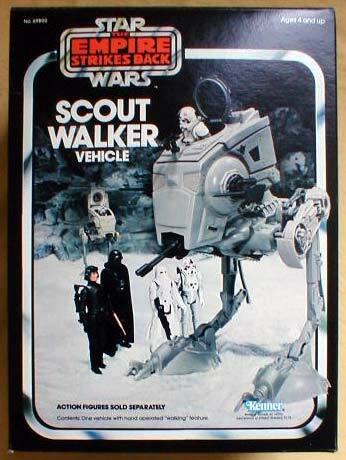 One of the best vehicles to be released by Kenner was the AT-ST Scout Walker. At the back of the "vehicle" there was a selector button, when "walk" was selected the Walkers legs would move up and down at the press of a button, and when in "stand" mode the legs locked. There were two side guns that could rotate 360 degrees, but the front canon had limited maneuverability and on the top of the Walker there were two hatches that allowed access to its interior. The AT-ST was released alongside the Rebel Transport ship and like most of this vehicles was only available on a TESB card. Top hatches -- large and small. 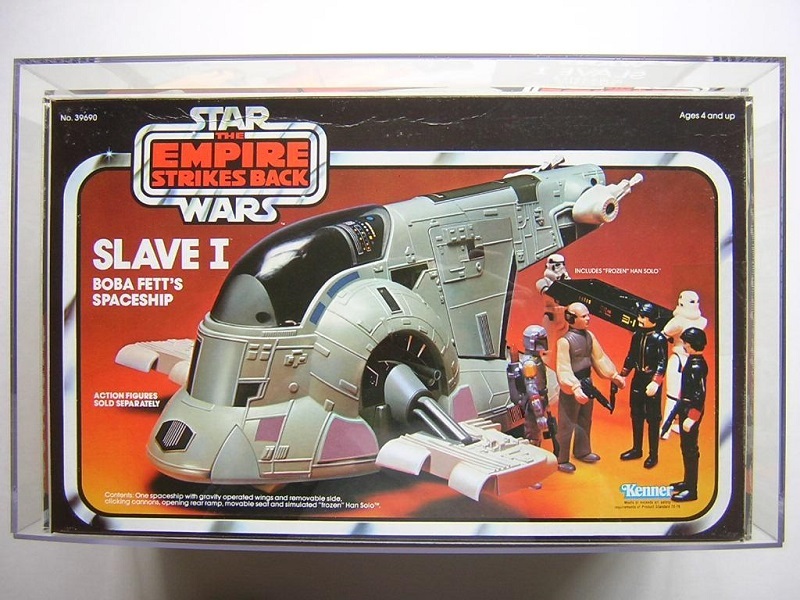 The Slave I ship was generally pretty plain and was one of the few released without any sound effects. In fact its only redeeming factor was the fact that it came with an exclusive Han Solo frozen in carbonite, some rarer samples also included a special cardboard back drop. Released in 1981 on a TESB card. This vehicle was probably the least popular of all with few features other than an opening canopy and retractable landing gear and even now it doesn't sell for a great deal on the secondary market. Released in 1980 on a TESB card. (2) Canopy assemblies: frame and glass. 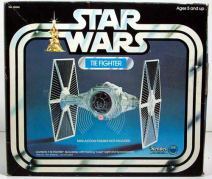 The BD Imperial TIE Fighter, which was released in 1983 to replace the standard TIE Fighter, resembled in original in every way except is cast made using blue plastic instead of whoite and there were 2 sheets of stickers for it, one sheet with stickers for the normal TIE fighter and another sheet with Battle Damaged stickers. It also featured wings that popped off when a release button was pressed to simulate being hit. There was also simulated laser sound, a red LED light under the canopy, a seat that could be raised or lowered and a hatch that opened, . 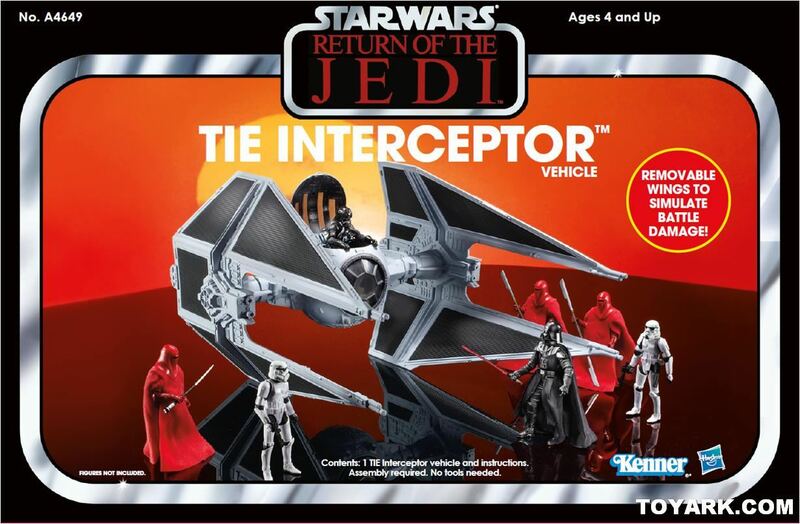 · (2) Wing extensions that attach wings to body of TIE Fighter. 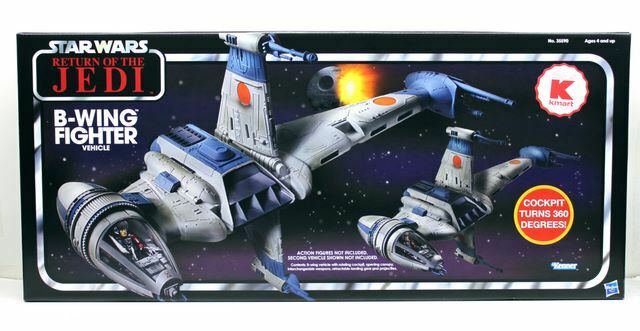 Released in 1984, the B-Wing Fighter was one of the most unusual ship/vehicles released. The vehicle featured a gravity controlled, rotating cockpit that even if you "fly" the B-WING upside-down, the cockpit (and the Action Figure you put inside it) will always be "right-side up". The wings also extended one of the rear engine pods was turned, it also had extending and retracting landing gear. As welll as being on one of the last and most expensive ships Kenner released, the B-Wing Fighter is also one of the hardest to find. 2 wing and gun assemblies. Although all the TIE fighters all used a common mold for the body of the ship the TIE Interceptor the wing extensions were redesigned as part of the wing itself, leading to a much stronger assembly. The wings were probably the coolest of all the TIE fighters and it was molded in a gray plastic giving it a very distinctive look. Released in 1984 this ship remains popular with colectors and fans making it one of the toughest Star Wars vehicles to find. Altough the Y-Wing Fighter was introduced at the end of of the first Star Wars movie Kenner didn't release one until 1984. The ship featured an opening canopy, a button-activated bomb rack, remote operated landing gear, a droid socket capable of holding R2-D2 or R5-D4 and a rotating top canon. Released in 1983 the Imperial Shuttle was a huge vehicle measuring a massive 22-inches in height and with a wingspan of 3 feet, making it the largest ship Kenner ever produced for their Star Wars line. The wings generally were kept locked in an upright but could be released to open simultaneously in a flying position by pressing a trigger button. This occurred through a central ratchet system which often broke. The Shuttle also featured a movable landing ramp, retractable landing gear, a cockpit for two figures and removable side panels for access to the interior. 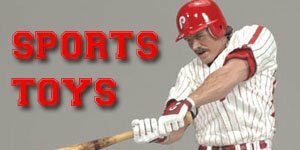 Due to its size and the number of parts in this set finding a loose complete set or mint set is very difficult. 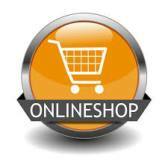 Guns: 2 front, 1 rear, 2 wing. There are two pieces to each wing gun. Ramp assembly: smaller piece fits into larger. The Speeder Bike is probably one of the most recognisable and popular vehicles from the Star Wars movies. 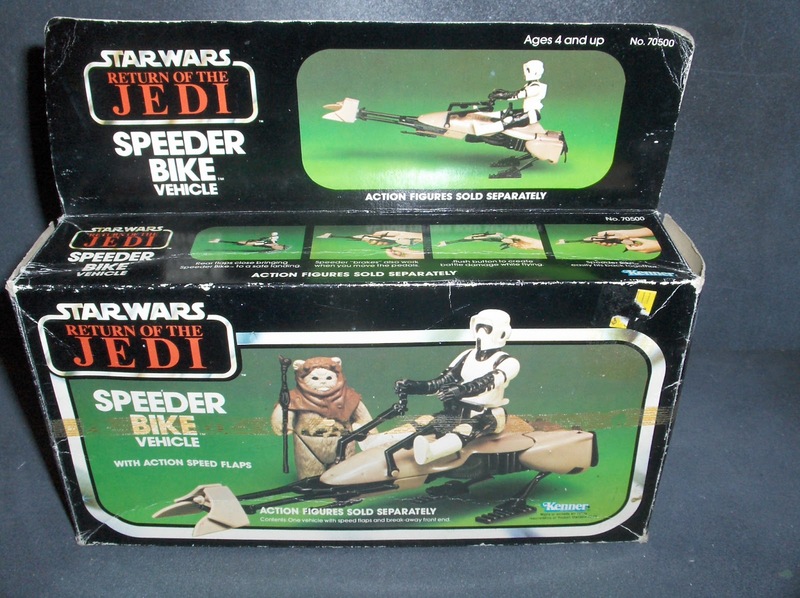 Released by Kenner in 1993 it featured button activated exploding action, Unusually, the Speeder Bike was packaged in a plastic tray rather than with the traditional cardboard insert. The Speeder Bike still remains fairly popular but it is reasonably easy to find so in is not as expensive as many of the other. 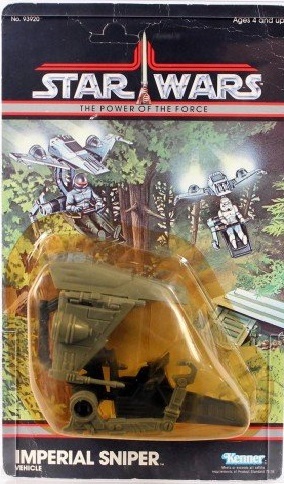 The Endor Forest Ranger was one of the strangest looking vehicles Kenner made in their Star Wars line. It was an armored repulsorlift vehicle designed specifically for the forest terrain of Endor. 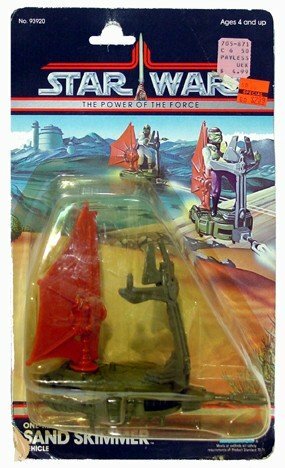 Released in 1984 it was on of the last of the mini-rigs to be released and is fairly difficult to find. 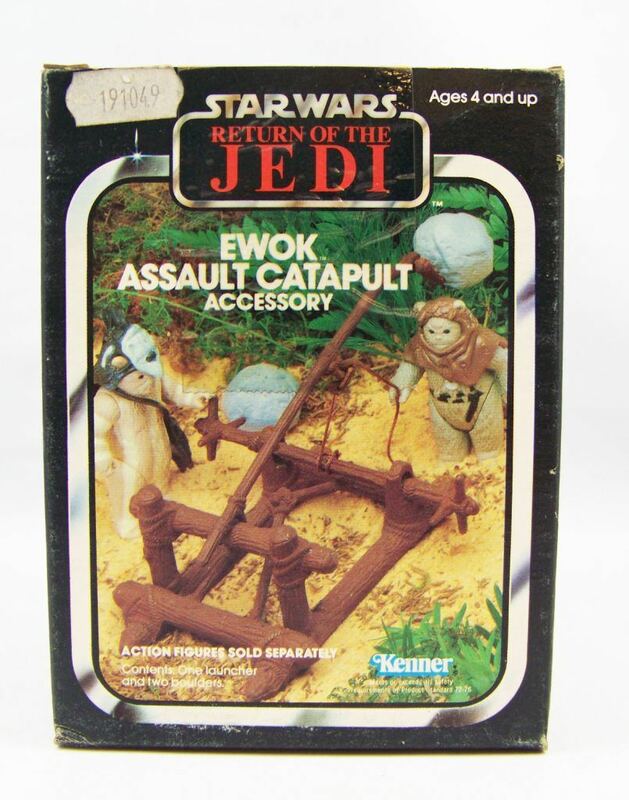 The Ewok Assaault Catapult was a neat, cheap little set that came with two plastic boulders as well. This was going to be released as part of the Ewoks animation set also, but this was cancelled. However the mold was later re-used for the Robin Hood Prince of Thieves line as part of the Battle Wagon set. 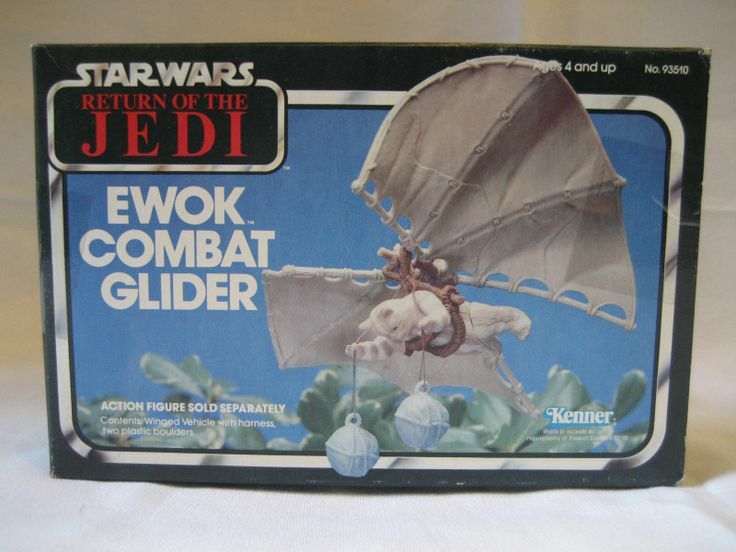 The Ewok Combat Glider, also known as a skin glider, was a very simplistic but effective vehicle. Although made specifically for the Ewoks any of the figures could fit on it. The Combat Glider also had quite a few small but key parts that were easy to lose so find a Mint Loose Complete (MLC) set very difficult. The glider was molded from tan coloured plastic and consisted of a flexible rubber harness, and two hollow plastic "boulders." However, it was a pretty cool little set that allowed for some great interactive play. 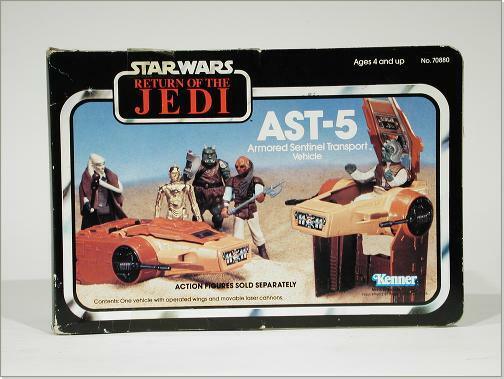 Released in 1985 this was one of the last vehicles released for the Kenner Star Wars line and due to declining sales and demand for Star Wars toys by this time few were made, compared to previous sets. The Battle Wagon consisted of a battering ram operated by a string, a ramp that could be raised or lowered at the front, a cage that could open for a figure to be put inside and a string operated hook at the back for lifting it. 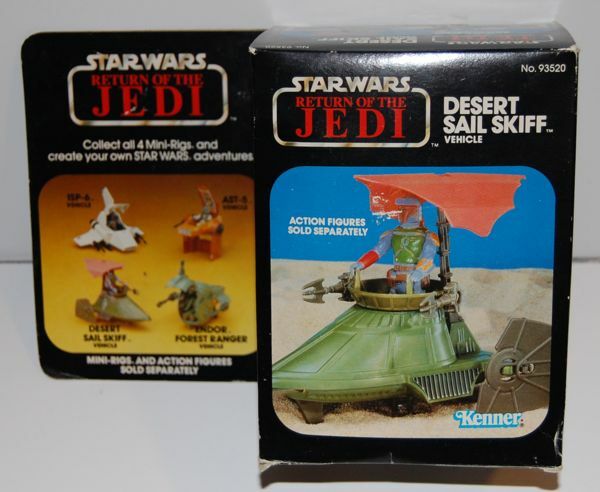 A catapult replaced the large skull on the top of the wagon (the Ewok catapult). The ladder, battering ram cover, and several other pieces are molded in different colored plastics. Copyright info on the bottom of the vehicle was updated to coincide with the Robin Hood release. 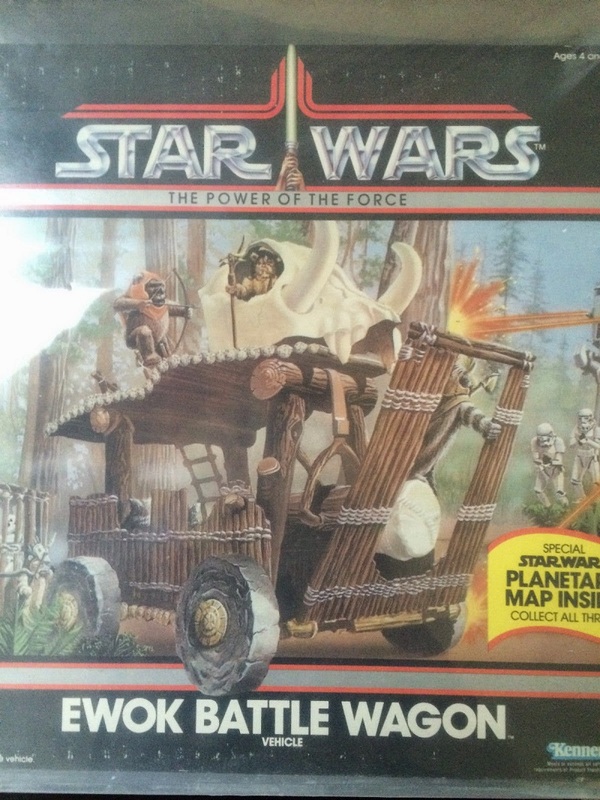 The Ewok Battle Wagon has a 1985 copyright. Skull assembly: skull, (2) removable tusks. Cage w/ string and hook. Battering ram assembly: Ram, two supports, string, front cover. Released in 1985 with the Ewok Battle Ram this was the last vehicle in the Kenner Star Wars line, and because of poor sales was produced in very low numbers. The Skiff had a gang plank that could be retracted at any time with an RC, movable rear fins, lever-controlled landing pods, and a weapons storage area and break away side railing to look like battle damage. Due to the low production run, its growing popularity and the number of small parts involved in this set, they have become very difficult to find in mint loose condition. (2) Rudder assemblies: rudder, rudder support. Hinged end of gang plank. The last three are technically not vehicles or ships but were classified as "Single Body Transport Vehicles" or 'body rig' for short. In fact these 'vehicles' were little more than a few thin bits of plastic which assembled into a small platform or some kind of seat for a figure to use. 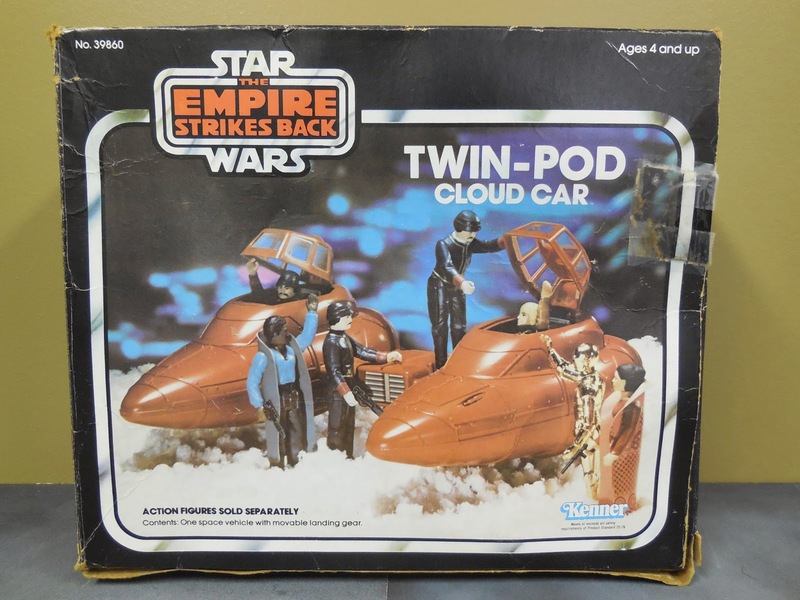 Despite this they were fairly popular at retail, probably because of their low cost, innovative design, and resemblance to actual Star Wars vehicles and easy of use. With the spiraling costs of oil and plastic and with inflation skyrocketing the mini-rigs series was created to offer kids a lower priced range of vehicles as most of the vehicles at this time were price at around $19.99 and higher. These vehicles were design as “off-screen” , that is they could have been in the movies but were just out of the camera range. 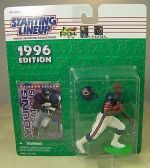 The two main driving factors, in my opinion, behind the success of this line was that kids could easily afford them unlike the larger vehicles, which took weeks for kids to save up their weekly allowance, and few weeks in the life of an excited, eager and impatient child was a lifetime. Also, they were FUN! 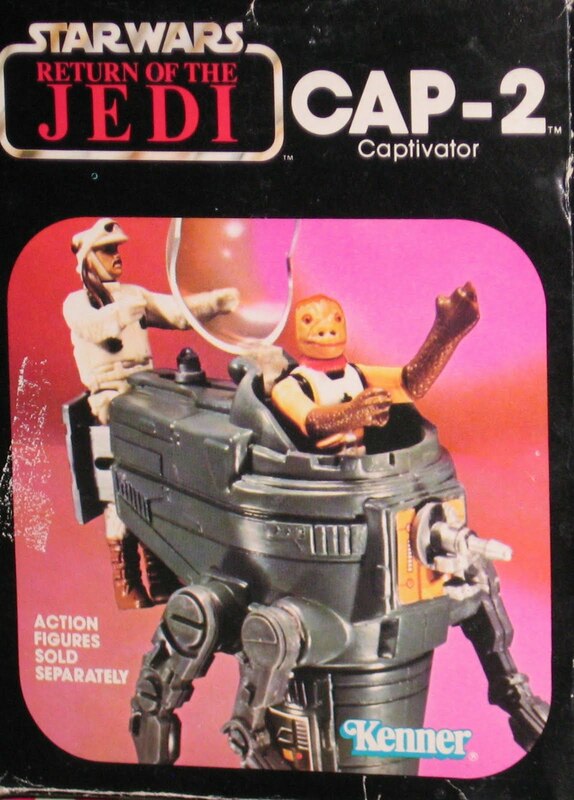 For such small and inexpensive vehicles they were packed with fun features, a prime example of this was the CAP-2, with its suction cup feet and grabbing arms.